Outside of stops at Deanie’s Seafood for take-away boiled crabs, I’ve never spent much time in the section of Metairie known as Bucktown. However, some recent rumblings in po-boy print have made me reconsider this position. First was Serious Eats and their duo of 36 Hours in New Orleans: The Budget Edition and their ideal New Orleans Day Trip. Second was the always excellent but sadly former food writer for the Times Picayune, Brett Anderson. For those unaware, Anderson has been trying to comb through the world of Nola roast beef po-boys in pursuit of his best, and after downing pound after pound of beef, he arrived at R & O’s as his favorite. With visions of a gravy induced stupor running through my mind, I got off the interstate and drove down West End Blvd towards R & O’s. Arriving in the middle of a busy lunch hour, it was a few minutes before I got to my table. From there, it was a quick look at the menu and then my order was placed for a half roast beef, half shrimp po-boy. Little did I know that, minutes later, my view on po-boys was about to change. 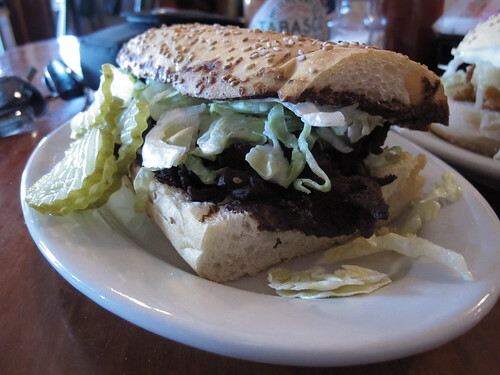 This was the first time I had encountered a sesame seed po-boy loaf in New Orleans, much less one that had been toasted. However the bread was a nonissue compared to the tar like beef and gravy contained within the loaf. Looking inky black and dry, I was expecting the first taste to be completely burnt. 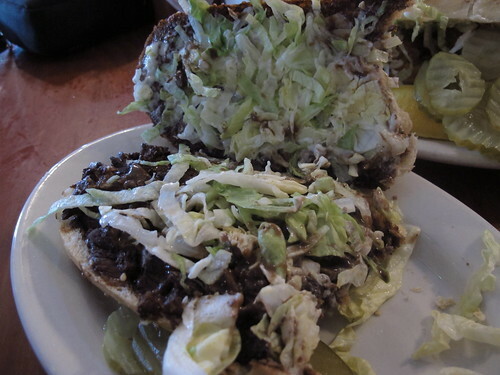 Once my first bite shattered through the crispy po-boy loaf, I was greeted with a deep, dark, and exceedingly rich flavor that was brimming with the essence of roast beef. 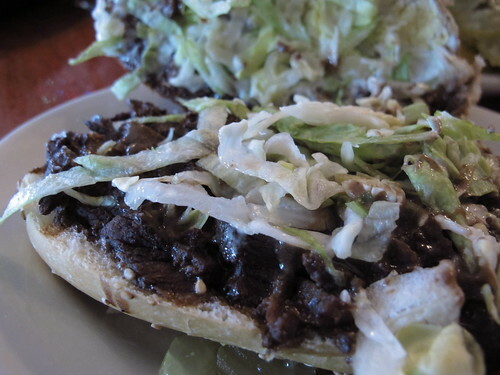 The fact that the top half of the loaf had been dipped in the gravy and then toasted was groundbreaking and that each of the baton shaped shreds of beef were coated in that silky, deep gravy only reinforced the obscenely delicious flavor of this po-boy. I could have ended my lunch there and been quite content but there was still half of a shrimp po-boy staring me down. 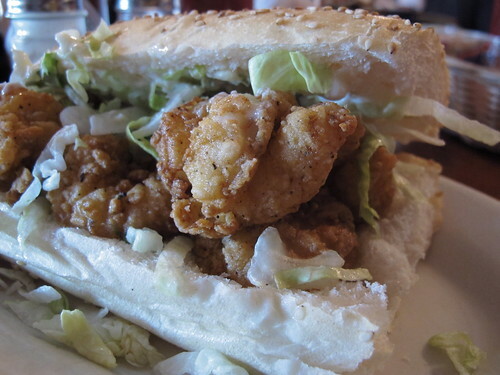 While this po-boy was hardly overflowing with shrimp, there was the perfect amount for each bite to have the briny crunch of fried shrimp. Speaking of briny, while these shrimp were plump and juicy, they were on the salty side. 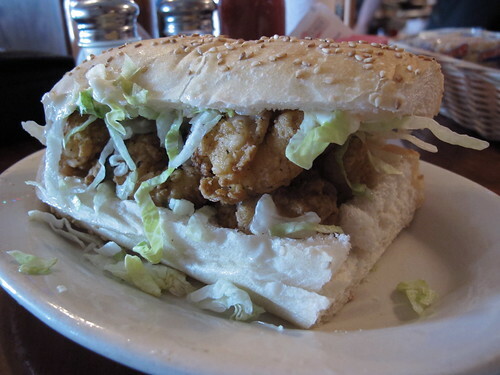 As for the rest of the po-boy, the toasted sesame loaf only reinforced the crunchiness of the shrimp, but a shot of hot sauce was needed to bring the mayo and rest of the dressings in line. While the shrimp po-boy was a perfectly fine example of the breed, it hardly warrants a special trip to Bucktown, but the roast beef is another story. Calling what R & O’s does with their roast beef po-boy unique is an understatement, this one lunch very well may have reshaped what I think a New Orleans roast beef po-boy should be or at the very least chipped away at the foundation of my belief that Tracey’s serves New Orlean’s best. Regardless, I will come back to R & O’s, if only for their roast beef, and, from now on, I’ll be hard pressed to leave the city without a taste of that sinfully rich po-boy.